Barrier Security Products has a low cost range of Anti Slip Rubber Floor matting ideal for a number of industries. Designed to be oil resistant and to provide an anti-slip and anti-fatigue surface. Has a wide range of domestic, industrial, commercial and agricultural applications. It is manufactured from hard wearing red rubber. Measures 910 x 1520 x 13mm the Anti Slip mats are colored red to distinguish that it has oil resistance properties. Non Oil resistant feature the same specifications but no oil resistant qualities. 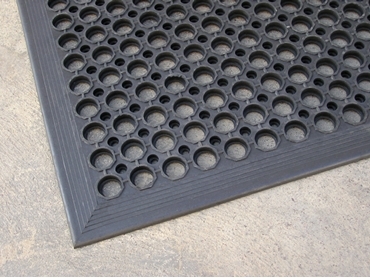 Anti Slip Mats are also available in standard black colour and oil resistant in brown Weight - 10kgs. For agricultural application ideal suggestions would be dairy farms, chicken hatcheries, shearing sheds as they can avoid slip accidents and are easy to hose down after days work.